– Rimmel Scandal Eyes Reloaded mascara, The Only One lipstick: CAD6.99; Insta powder, professional brow pencil, Oh My Gloss: CAD7.99; Magnif’eyes palette: CAD12.99. 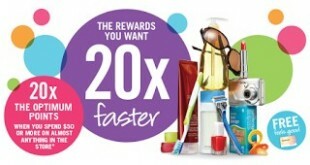 – Erase Your Face cleansing cloth: 20% off (bonus miles). – L’Oreal Infallible Pro Glow foundation: CAD14.96. The Bay: $20 off $150+ purchase online until September 21 with code FALL. Exclusions apply. The Body Shop: B3G3F in stores and online. LYB members get $5 off Expert facial masks in stores and x2 points in stores and online this weekend.